In an area known for its towering red sand dunes, Sossus Oasis Camp Site is a little oasis for camping enthusiasts wanting to visit the renowned Namib Desert. Enjoy shaded individual camp sites, each with its ablutions and electricity, a perfect base from which to explore the contrasting desert landscapes and remarkable depths of the Sesriem Canyon. At night marvel at the star studded skies whilst listening to the tune of the barking gecko and the far cry of a jackal. A fuel and service station, internet cafe and, stocked utility shop is available at the adjacent Sossus Oasis Service Station. 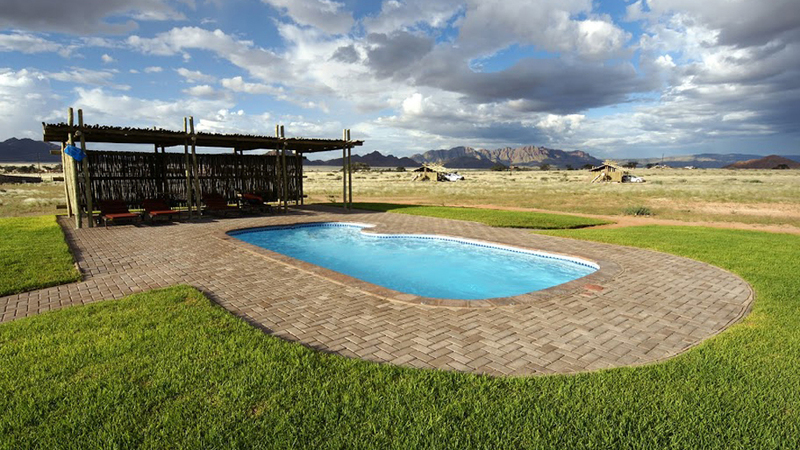 Meals and guided activities can be booked at the nearby Sossusvlei Lodge. Sossus Oasis Camp Site offers 12 shaded individual sites in a clean, tidy and well maintained environment. Each electrified site has the luxury of its own toilet, basin, hot & cold shower, barbeque, kitchen wash up facility. Enjoy magnificent views from the paved veranda whilst discussing the days adventures. Camping is a purely self catering experience. There is nothing more rewarding then the sound of your camp fire after a long day’s adventures in Namibia. The conveniently located Sossus Oasis Shop sells freshly baked breads, hot pies, meats, salads and other take away foods. The shop is also stocked with curios, clothing, groceries and toiletries in case something was forgotten. For an extra treat, dinner at Sossusvlei Lodge is a good option.